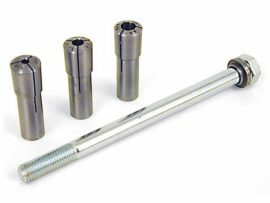 This easy-to-use end mill holder screws onto the threaded end of the mill spindle. End mills are held in place with a single 10-32 set screw that tightens against the flat on the side of the cutter. 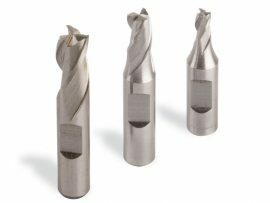 This assures the end mill cannot spin in the holder during a heavy cut as is possible in a collet. An end mill holder also provides more support area for the end mill compared to a collet. A 3/32″ hex key (not included) is used to tighten the 10-32 set screws. The 6081 1/8″ end mill holder uses two 4-40 set screws. A 5/64″ hex key is included with that holder. 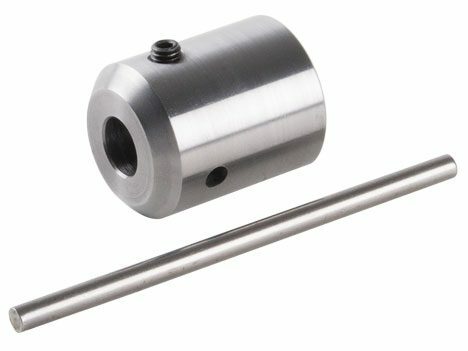 Because of the ease of use of this type of cutter holder and the fact that it allows the use of longer or double-ended end mills, we have also made it available for other size cutting tools as well, but most American customers will find 3/8″ tools to be available in the largest volume and variety and, therefore, the lowest prices. 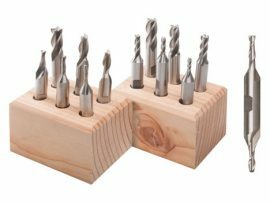 In addition to end mills, special purpose cutters such as those designed for cutting key slots, dovetails, and corner radii usually have 3/8″ diameter shanks. The Sherline end mill holder will increase the versatility of your milling machine by enabling you to hold these popular cutters. These holders also make a good “quick-change” tool system. By keeping your favorite cutters mounted in their own holders, changing cutters is a quick operation. Just unscrew one holder from the spindle and thread on another. In CNC operations, having several numbered holders pre-mounted with their own end mills means that each time a tool is changed, the tool length for any given tool remains unchanged. This means the tool diameter and length values in the tools table of your CNC program do not need to be updated. NOTE: The thread “pitch diameter” on both the end mill holder and the headstock spindle are held to a tolerance that is almost an interference fit. We do this to keep the runout as low as possible. Some of the end mill holders may fit tight when you first use them. We highly recommend that you wipe a drop of light oil on the threads of the end mill holder before you thread them onto the spindle. *Please note that when using the 1/2″ x 1.2″ end mill holder (6083) or the 1/2″ x 2″ end mill holder (6086), be aware of the length of the shaft of your cutter. The hole through the spindle is .405″ so a long end mill would not be able to go through the spindle. CAUTION! Always consider power and size limitations of your equipment when using larger cutters. You may want to reduce cutter speed. Because the part is small and appears simple, its cost may cause some to question our pricing. In order to provide the accuracy needed in a part of this type, the threaded hole, and the end mill hole must be absolutely concentric. Though this part may look simple, it is not easy to make. It must be made very accurately to be of any use. They are made on a CNC machine in a multi-step operation. To accomplish this, approximately 10 boring, threading and drilling operations must be done on a very precise computer controlled lathe. To maintain concentricity, the threads cannot be tapped but must be single pointed, which allows the part to run very accurately even though it is held on a threaded surface. The result is a strong, easy to use and highly accurate part where nothing less will do. To make this part using cheaper methods would reduce its usability and value to zero. If you want to use 3/8″ (or another size) end mills, double ended cutters, or special cutters with the ease and accuracy of this system, you will find the cost of this part is money well spent in time saved. 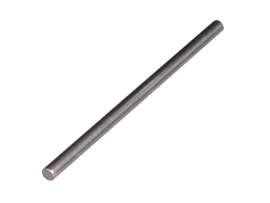 Spindle “Tommy” Bars are use to aid in the operation of opening and closing scrolling chucks and in the headstock spindle to provide leverage when unthreading tooling. They have a diameter of 5/32″ and are 3-1/8″ long.